The Titanfall developers are making a Jedi game. Respawn Entertainment's Vince Zampella just announced the name of their new Star Wars game, which we've known as being in development for a while. 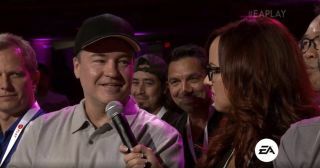 It's called Star Wars Jedi: Fallen Order, and it's set between Episodes III and IV. It's set during dark times for the Jedi, at a point where they're being hunted. As the name suggests, it's a Jedi-themed game, but that's pretty much all we know at this stage, aside from its release date: Fall 2019. Here's a bit more clarification from the Star Wars official website: "the game will be a single-player, action-adventure title that tells a new story set shortly after the events of Star Wars: Revenge of the Sith."